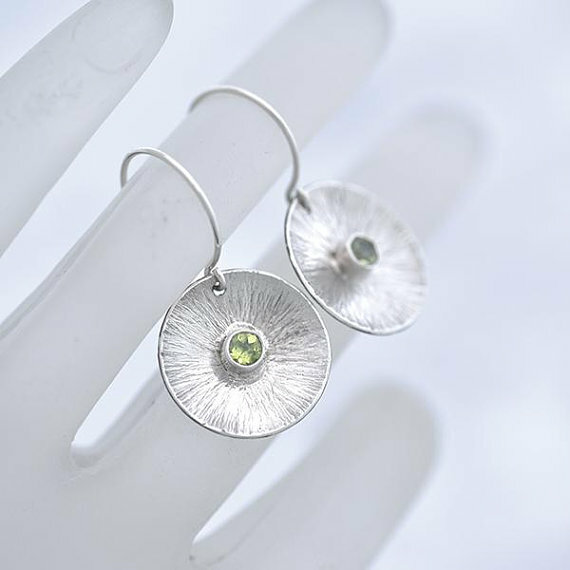 Round Silver Peridot Earrings – These are sterling silver earrings with Peridot. Each sterling silver disc is domed with a subtle and smoothed hammered finish creating radial lines which both catch light and bring emphasis to the stones. The round sterling silver ear wires complement the earrings and each disc has a subtle beveled edge to define the perimeter with an additional glint of light. A splendid jewellery gift! * Sterling Silver Diameter: 20mm approx. Polished interior with radial lines.